PETALING JAYA: The local hospitality sector can look forward to a steady growth this year, given the number of initiatives to promote the tourism industry, property consultants said. Knight Frank in its Second-Half 2011 Real Estate Highlights report said the local hospitality sector remained optimistic that performance levels would show steady growth. It said this was despite analysts predicting moderating economic expansion ahead as a result of slowing external demand and continued uncertainties in the Middle East, Europe and the United States. “Moving forward, the Government will seek to enhance various sector-specific initiatives that focus on high-yield visitors, in particular business and medical tourism. The Budget 2012 announcement will keep the 4-star and 5-star hotel category at the forefront of development opportunities with the provided benefits in the form of tax exemption or allowances. “With concerted efforts from all parties, Malaysia will remain well positioned to retain its ranking among the global top 10 tourist arrivals and top 15 tourist receipts,” the report added. Knight Frank said tourism contribution to gross national income was expected to almost triple the 2010 figure of RM34bil to RM94bil by 2020 (ranked the fifth-largest contributor to national economy in 2010). The growth-centred Budget 2012, announced in October last year, is generally well received by the wider hospitality sector. In the Budget, the Government has pledged to assist the private sector in developing more international standard accommodation to attract a higher number of tourists through a “pioneer status” income tax exemption of 70% or an investment tax allowance of 60% for five years for new 4-star and 5-star hotels in Peninsular Malaysia. CB Richard Ellis Research, in its fourth quarter 2011 report on Kuala Lumpur's hospitality sector, said it hoped the various initiatives under the Economic Transformation Programme would be successful in stimulating demand, especially in raising tourist arrivals and average spending. It also hopes that growing tourist arrivals from China, India and the Middle East would compensate for the likely continued decline from struggling Western economies. “Tourism Malaysia is maintaining its target of 36 million annual visitors by 2020 with an estimated revenue of RM168bil, up from 24.6 million tourists with revenue totalling RM56.4bil in 2010,” the report added. It said the hospitality market performed better in the last quarter of 2011 compared with the same period in 2010, led by improvements in overall occupancy rates for 3-star to 5-star hotels. Although Kuala Lumpur had some of the lowest room rates for luxury hotels in the region, the announced redevelopments in the city centre would add to the growing quality of the city's hospitality market, it added. The Knight Frank report said industry leaders had now fully recognised the importance of the MICE (meetings, incentive, convention and exhibition) industry as a major contributor to the economy. The Tourism Ministry, which established MyCEB (Malaysia Convention and Exhibition Bureau), plans to further strengthen the nation's tourism brand and grow the total number of conventions and exhibitions held on home soil. The number of MICE visitors is expected to reach 1.3 million for 2011 with RM10.8bil in receipts (2010: 1.28 million visitors and RM10.6bil receipts). It said the Government's concerted efforts to attract more arrivals from the BRIC economies (Brazil, Russia, India and China) through various measures, including a simplified and shortened visa application process, had shown excellent results with recently released figures showing the number of Chinese tourist arrivals increased by 57% between January and July 2011. As at November 2011, there was a total stock figure of 17,862 hotel rooms in Kuala Lumpur. The supply figure of 4-star and 5-star hotel rooms in the city currently stands at 7,667 and 10,195 respectively. During the review period, average occupancy rates for 4-star and 5-star hotels in the city registered increases to 72% (first half 2011: 69%) and 71% (first half 2011: 68%) respectively. Both occupancy and average room rates (ARR) for 4-star and 5-star hotels have shown an improvement over the second half of 2011 review period to November. 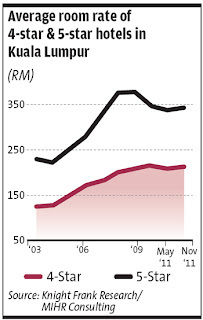 The ARR for 4-star hotels was recorded at RM214 (first half 2011: RM209), reflecting a 2.39% increase, while the 5-star category saw a 1.18% increase to RM343 (first half 2011: RM339). Knight Frank said that during the second half of 2011, Kuala Lumpur's hotel market maintained a reasonable performance with steady improvements in the tourism industry. “This sub-sector continued to perform well on the back of an increasing number of promotional activities and Kuala Lumpur's growing reputation as a dynamic and competitive shopping hub and host for global sporting events (such as Le Tour de Langkawi, F1 Grand Prix, PGA and LPGA Tours, ATP World Tour, EPL pre-season tours for Arsenal, Chelsea and Liverpool) and business/conference events,” it added.